Easter Cascade Forest Escape is another new point and click live escape game from games2rule In this game, you came to celebrate the Easter weekend holidays in a cascade forest which is located outer of the city. But unfortunately, you missed the way out. You have to find the way to escape from there by finding useful objects, hints and solving puzzle. Click on the objects to interact with them and solve puzzles. Good Luck Have Fun! Games loads and then won't start. I really wanted to play this one, but it does not work right. took 18 tries to load it and now it is stuck in a close up scene and the back arrow does not work. Fix your stupid game! Did clear cookies and tried everything else I could think of. I finally got it loaded properly on the WOW games site. I need the hint for the 5 crosses? NVM I finally found the axe. Out now. Thanks for leaving great hints. I can't help with the loading problem but if you get stuck in a close up view, check that there isn't an advert hiding at the bottom of the screen. There may be an almost invisible X lower right corner of your screen. It's happened to me several times. If mine don't load, I usually need to go to the lock on the left on the address bar and unblock downloads, popups and flash. Can't find a use for the magic wand. 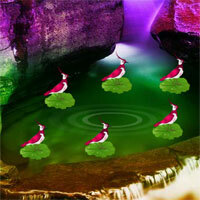 Need 1 more pink lily pad flower for set of 10 and clue for 5 eggs on rocks for clicking order. Karen use the wand on the 2 white rabbits.